Rethymno is surrounded by the sea from the north. Rethymno's beach is spreading from the centre of the town, along the new part, for 12km to the east. 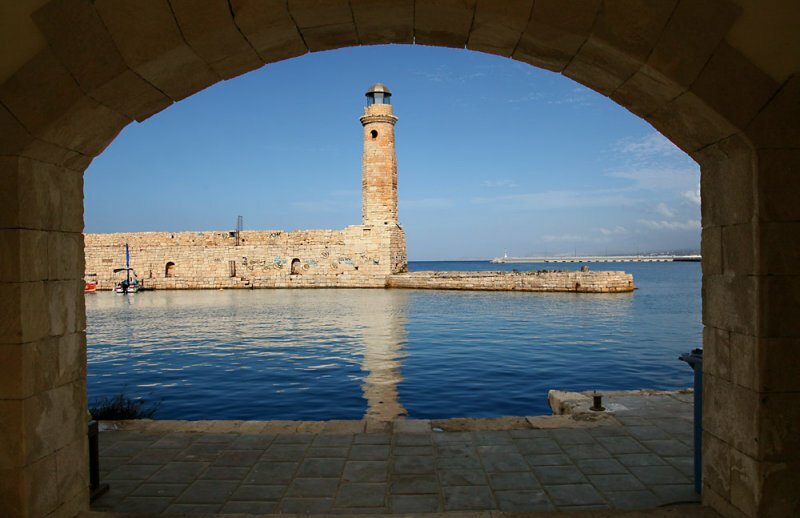 To the west, starts the palm-lined promenade leading to the picturesque old Venetian port of Rethymno and continuing through the town's harbour to a rocky shore, along the Venetian fortress. Fortezza castle. (Daily, from 9am to sunset). At the place where the ancient acropolis was, one of the largest Venetian castles, overlooking the sea and the town. It was built in the 16th century to protect the population of the town against the pirate raids. Inside, where once a big number of buildings could be found, now only some tanks and a mosque (before a Catholic church) with a very big cupola, stay almost intact. These remains, as well as the view of the town and the coast, make it necesssary to visit. The walk along it, from the side of the sea, at sunset, offers a glorious view of its impressive defending walls and ramparts, -that become illuminated at night, together with romantic images of the coast. The Venetian harbour. 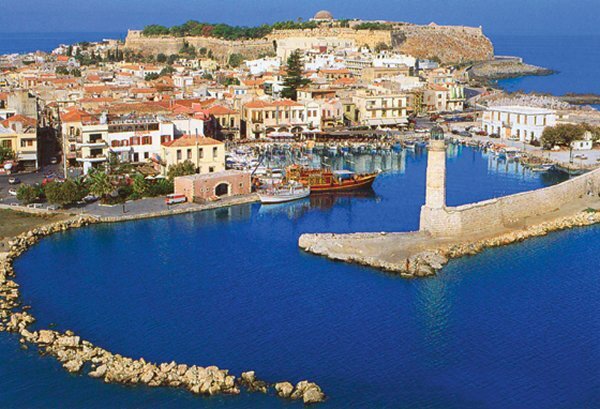 Originally built in the 13th century, it is one of the most picturesque spots in Rethymno. Rimondi fountain. Rebuilt in 1626, on the foundations of the older one to provide the population with drinkable water, it is rich in architectural and sculptural decoration. Loggia. At the corner of Arkadiou St. and Paleologou St., it was built in the middle of the 16th century as a gathering place of the nobility, for politics, economics or entertainment. 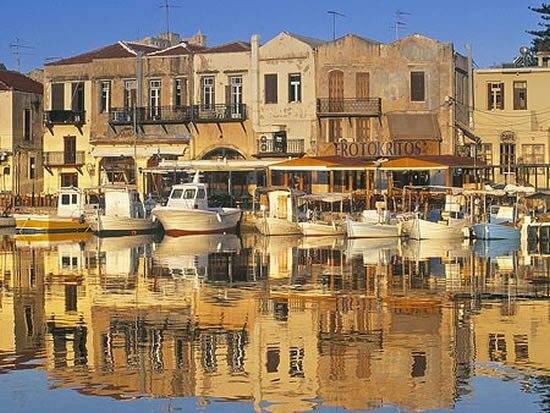 The building is one of the characterisic examples of Renaissance architecture in Rethymno. During the turkish occupation it was converted into a mosque. Recently it was renovated to become the Archaeological Museum Shop. Saint Francisco's church. The church of the Franciscan order's monastery, with nice architecture and a richly decorated door. Neratzes mosque.The largest of the five surviving mosques from the original eight. 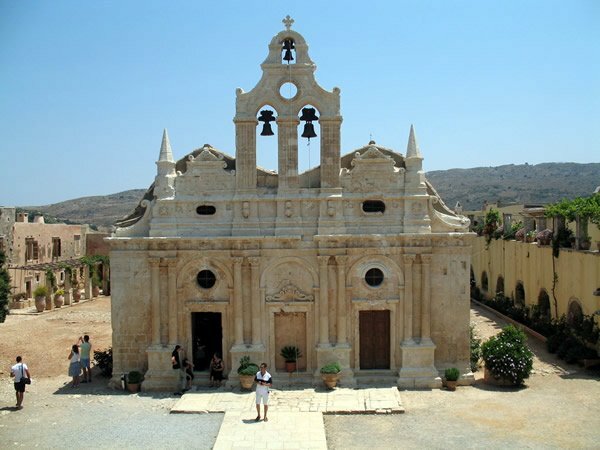 Previously the Santa Maria church, it was converted into a mosque from the Turks. It is topped with three cupolas and today it is used as a music conservatory. Next to the mosque there is the impressive minaret, built at 1890. The view from the top cannot be enjoyed, since the entrance is not allowed for safety reasons. Kara Mousa Pasa Mosque. At the end of Arkadiou St., where before was a venetian monastery. Today it is the house of the Restoration Board. Veli Pasa Mosque and its minaret. 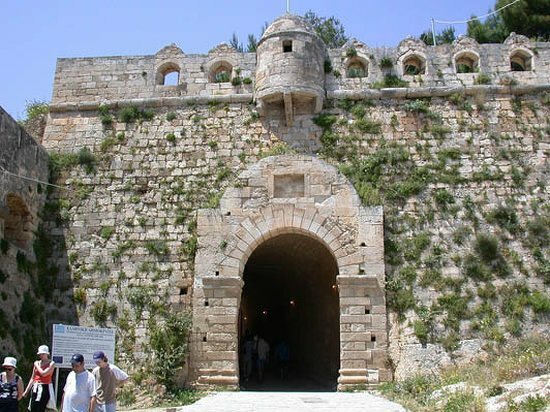 It was surrounded by an islamic monastery, of which 13 continous cells have been preserved. In the future it will probably host a permament exchibition of physiology. Porta Guora. The entrance to the town during the Venetian occupation and the only remnant of the defensive wall. In the beginning of Ethnikis Antistaseos St. The Municipal Garden. At P. Kountourioti Ave., open all day. In summer it hosts the Wine Festival. The Archaeological museum of Rethymno (8am to 3pm, closed on Monday), just opposite the entrance of the fortress, exhibits objects from the Neolithic to the Roman period, found at the prefecture of Rethymno. Clay figurines, funerary coffers, grave offerings, statues, grave steles, red-figure vases, bronze vessels, jewellery and glass vases, are some of the objects on display. The Marine museum displays shells, sponges and fish. The Ecclesiastical Museum houses the old watch of the cathedral, garments, disks, coins, etc.